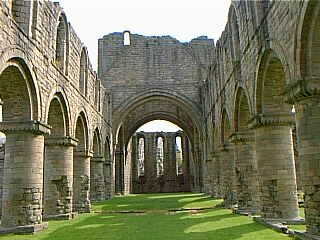 Buildwas Abbey was founded in the 12th century by the Sauvignacs and taken over almost immediately by the Cistercian order. It was built over a hundred years or so, and thereafter not much altered. 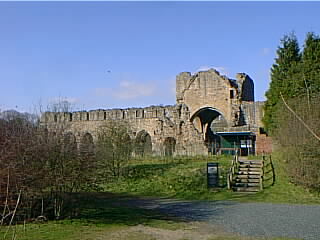 Despite occasional raids by the Welsh, it continued in good order until surrendered to Henry VIII. 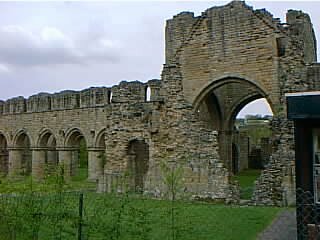 A view of the Nave and South Transcept from the south-west. 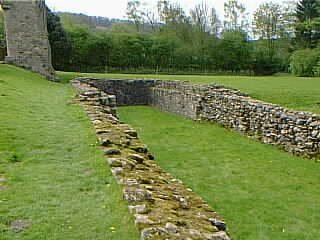 Because of the rise in the ground, Buildwas had no West Door. 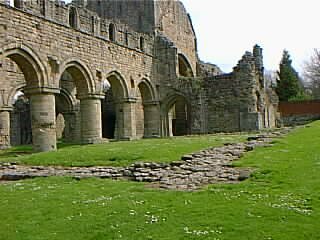 The nave, seen from the west, takes advantage of the natural rise in the ground. The three narrow east windows are later replacements for smaller ones. The night stair down from the dortor (dormitory) can be seen in the North Transcept. 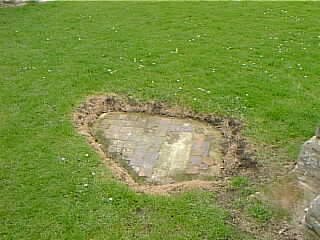 A fragment of tiling of the North Trascept floor has been preserved. 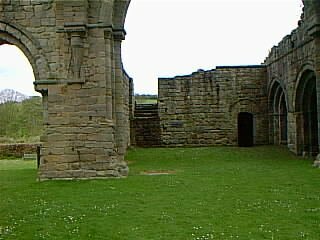 The East Range housed the Parlour, Chapter House and Sacristy, with the brother's frater over, and a crypt below. It was continuous with the North Transcept. The largest and most ornate door in the East Range leads to the Chapter House. 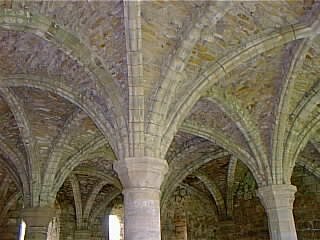 The very fine ribbed vaulting of the Chapter House roof. 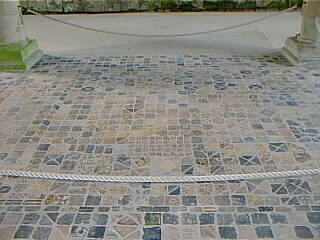 A part of the tiled floor of the Chapter House remains in place. 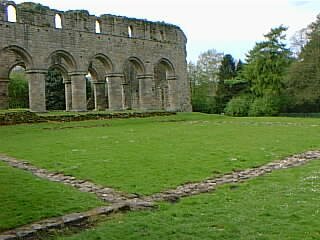 At Buildwas, the cloister is unusually situated to the north of the nave instead of the south. 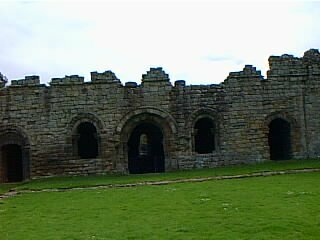 The West Range housed, on three storeys, cellars, kitchens and the lay brothers' frater. 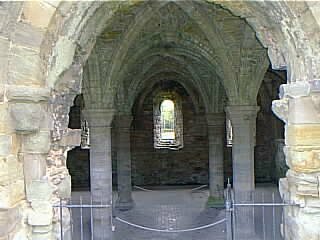 This chapel, south of the nave where the cloister is in many monasteries, is a 14th century addition. 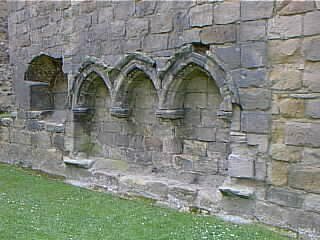 The Sedilia in the south wall of the Presbytery are another 14th century addition. 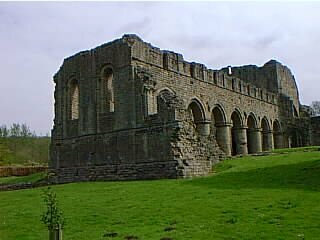 Buildwas Abbey is an Ancient Monument in the care of English Heritage.